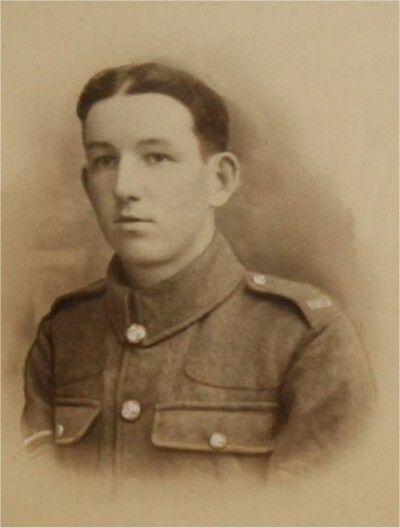 Morris was killed in action on 8th October 1918 aged 25. Morris Davies was born in 1893 in Hope. His parents George Davies and Harriett Griffiths were married in Birkenhead in 1890. In 1891 they were living at Higher Pant Cottage in Shopymynydd, Hope, with Harriett’s father John Griffiths, and their oldest son Frank. By 1901 they had moved to Pant Horeb, Cefn-y-Bedd. George Davies was 45, a labourer, Harriet was 45, Frank was 10, Maurice was 7 and Gladys was 8. In 1911 Morris was 17, and was living and working as a farm labourer at Stanley Grange, Penyffordd. David Hughes a retired builder (present farmer) and his wife Catherine and their family lived at Stanley Grange. The 1911 census for his parents tells us that they had been married for 20 years and Harriet had given birth to 3 children, all of whom had survived. Morris’s military records haven’t survived, but we know from the Soldiers died in the Great War 1914-1919 (available on www.findmypast.co.uk) that he enlisted in Wrexham early in 1916 and was killed in action on 8th October, 1918, probably at the Battle of Cambrai. There is an index card for Morris Davies in the Flintshire Roll of Honour at the County Record Office in Hawarden which confirms the regimental details above. In some records Morris is listed as Maurice. He is also listed on the Caergwrle War Memorial.